On Thursday the 9th of May Damon Klotz from The Fetch Community Ambassador team in London went along to the Chinwag Psych event that was put on by Chinwag and hosted by Nesta. 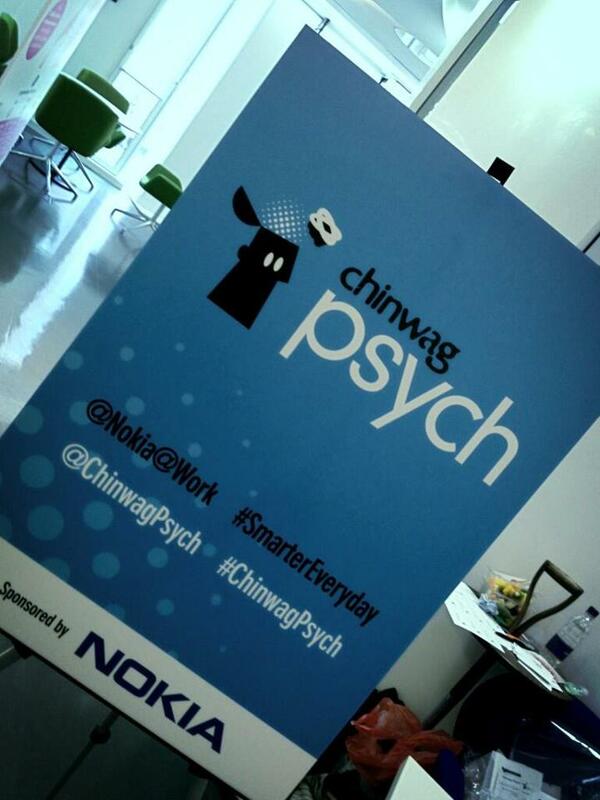 Chinwag Psych was a one day conference that covers psychology, neuroscience and big data for business and marketing. The event gave me a chance to not only flex my brain muscles for a day but also check out a new part of London having only been working in the city for a couple of weeks. Using my trusty London City Mapper App (a must for any tourist or newbie Londoner) I set off towards Chancery Lane. As good as the app was at getting me to the right area I still managed to walk around in circles trying to find the building, but I did so with a determined look upon my face that said I know exactly where I’m going and I meant to walk up and down the same street twice. After finally finding the right building I navigated my way to the all important row of seats near the power points, crucial for any prolific tweeters or bloggers in the audience. I was looking forward to being a member of the audience. Sitting back and listening, I enjoyed not dealing with the pressure of being the speaker. Chingwag impressively fit 15 speaker sessions into the one-day conference, so I had my laptop out ready for the inevitable information overload. The conference was split into four sections: approach, optimize, predict & behave. Rather than trying to summarise every single speaker I’m going to highlight some of the key takeaways from each of the sessions including links to some of the really useful slideshares. – Craig Sullivan boldly told us to shut up and listen. Listen some more. Ask good questions. Repeat. He had everyone engaged and snapping photos of his slides where he taught us how to practically apply psychological insights, customer feedback, behavioural and analytics testing to split testing. Nothing I write will do his talk justice so all I will say is his slideshare is a goldmine of information that you should definitely have a look at. – Stephen Haggard & David Stillwell spoke about their research that was picked up by news publications around the world that argued they can predict future behavior and determine your sexuality, political leanings and intelligence just based on your facebook likes. It was fair to say that everyone in the crowd was enthralled but also a little on edge and double-checking their facebook security settings! – Cat Jones from Unruly Media spoke about the science of sharing videos online. She raised some interesting points such as the fact that you can’t predict sharing, the average share rate of a video is only 4%, 2013 will see the rise of the prankvert due to no major events to jump on the back of in 2013 & that 25% of all shares happen in the first three days. – Daniel Bennett & Marina Clement from Ogilvy Change, the behavioral science practice of Ogilvy, finished the day off with their case study on how they significantly increased subscriptions to The Times. This case study successfully applied many of the techniques that were spoken about during the day. They used four nudges of psychological pricing, choice overload, superiority bias and setting defaults to provide a return of £1:£257. I left the event feeling more exhausted and brain dead then I usually do when I am the one up on stage. So much to absorb in a short space of time, luckily I could look back at the hashtag for the event and the slideshares from the presenters to go back over it all. My biggest takeaway was that there are lots of ways that we can optimize our websites and blogs that will help engage, persuade & sell. Optimising requires constant analysis and given the amount of data that we now have available, there is no excuse to not be listening to our audience and constantly tweaking our sites to get the best from them. All of the presentations from throughout the day can be found here. About our Ambassador // This article was contributed by Community Ambassador Damon Klotz. Damon splits his time between being an intrepreneur by day at Ramsay Health Care, where he heads up Digital Strategy. He also cofounded a men’s mental health campaign, Soften The Fck Up, and blogs about the application of digital tools in business and the start up world.